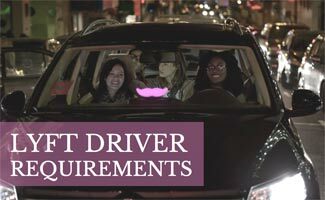 Home > Travel > Ride-sharing > What are Lyft Driver Requirements? What are Lyft Driver Requirements? Looking for extra income? Wondering how to become a driver for Lyft, the fast-growing company that’s giving ride-sharing giant, Uber, a run for its money? Driving strangers around town in your own car may seem a risky venture, but Lyft covers its bases for both drivers and riders. The company has stringent rules to ensure the safety and security for all involved. What does it take to become a Lyft driver? Read on to learn the current Lyft driver requirements. Of course, the first thing to check is if Lyft operates in your town. Lyft is expanding rapidly in the U.S. (and has plans to launch globally). As of spring 2016, you can find Lyft in more than 200 U.S. cities and 31 states. They target large to medium sized metropolitan areas, as well as cities with large university campuses. Lyft’s website has a comprehensive list of all its locations. You must be 21 years of age to be a Lyft Driver and have a valid U.S. driver’s license for at least one year. You’re also required to have a current car insurance policy with your name as the policyholder. Lyft requires all drivers to undergo a professional third-party DMV check, as well as a national and county background check (you must have a Social Security number). In New York City, the Taxi and Limousine Commission conducts DMV and criminal background checks, instead of Lyft. More than three moving violations within the past 3 years, including traffic light violations, accidents, etc. A major moving violation within the past 3 years, including, reckless driving, driving on a suspended license, etc. Any driving-related convictions in the last 7 years, including hit-and-run, felonies involving a vehicle, etc. Lyft drivers must have a smartphone (no tablets or WiFi-only devices, such as iPads). Lyft’s current mobile apps require an iPhone 4 or newer running iOS 7.0+, or Android devices running 4.0+. What Are Lyft’s Vehicle Requirements? Are There any Other Lyft Requirements? In some of Lyft’s markets, drivers must obtain special licenses, permits, or inspections, as mandated by state or local governments. These states include: California, Colorado, Hawaii, Kentucky, Nevada, Oklahoma, Pennsylvania, Utah and Virginia. Additional local standards: Chicago, Cincinnati, Dallas, Miami, Minneapolis-St. Paul, New York City, Portland, Seattle/King County, and Washington, D.C. Lyft’s website includes detailed information for each market’s additional requirements. How Much Does a Lyft Driver Make? On its website, Lyft says that drivers can make up to $35/hour, and Glassdoor.com reports a $20/hour average (but wages can range anywhere from $8-$40). Lyft drivers receive 80% of ride fees from passengers (e.g. you’d earn $24 for a ride that costs a total of $30), and you get to keep the entire amount of any tips you receive. Also, if you drive during Prime Time (pre-determined peak hours), you can earn even more. Lyft deposits your wages into your account once a week. For more information and to see a comparison of Lyft vs Uber pay, read our companion article, Driving for Lyft vs Uber. We couldn’t resist sharing this video with our readers — see what happens when Shaq becomes a Lyft driver for a day. Why Drive for Lyft vs Uber? Many drivers who’ve tried both services say Lyft is a more enjoyable, laid back experience. As you saw in the video, Lyft riders often hop in the front seat, and have a fun, casual encounter with someone you’d likely never meet in your everyday life. Both Lyft and Uber frequently offer driver incentives, and both follow stringent DMV and criminal background checks, as well as vehicle standards. If you drive for Lyft, how was the screening process to get approved? Thanks Sally, I am on the fence about Uber vs Lyft but am leaning towards Uber since it seems a little unsafe to have someone in the front seat. I wonder if you can keep something in your front seat and/or politely ask a rider sit in the backseat or if that is a policy of Lyft’s?